Publishing videos via the Quick Publish tool in the Media Module is fast and easy. But for those of you with large content libraries and a large number of video players throughout your web properties, there's a trick that can save you time. Today I'll show you how to use the Reference ID feature of the Studio to simplify the process of programmatically assigning content to players. I'm not going to explain how to use these parameters - there's a fantastic support doc that covers this. What I do want to show you is how to use the Reference ID to simplify the process of programmatically assigning content. All videos, playlists, and players are assigned a unique ID number that's used for identification purposes, specifically with the parameters I mentioned above. The Reference ID allows you to add another unique ID to use in place of that number. This can dramatically simplify the process of adding a new player to your site, since you won't need to constantly refer back to the studio to get the ID numbers. The Reference ID can also be handy if you're managing your videos and web pages in a content management system (CMS). You can assign a Reference ID to a video that matches the ID used by your CMS, so you can easily match up the same info in the CMS and the studio. For example, I've assigned the Reference ID "Lionfish" to the embed code below. 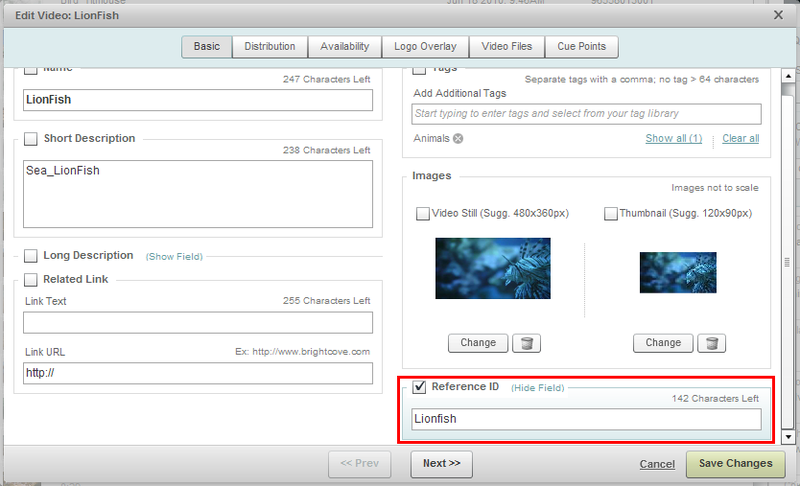 Instead of going through the Media Module, finding my video, and using the Quick Publish button to generate the embed code, I simply took the embed code from one of my previous posts and replaced the @videoPlayer value with "ref:Lionfish" (make sure to add the ref: tag before the Reference ID). If you find yourself adding video players to your site all the time, this can save you hours of work. Remember: you can also assign a Reference ID to playlists, and assign playlists to your video players via the embed code instead of going through the Studio. Just be sure to keep all your Reference IDs unique so that Video Cloud knows which video or playlist to display! This step is simple — just select your video in the Media Module, click on Edit at the bottom of your screen, and check the box next to "Reference ID." A small text box will pop up, allowing you to enter a reference ID.